The northeastern part of Greenland has been experiencing huge amounts of ice loss since the past decade, triggering alarm in the scientific community. The ocean in this region was believed to be stable and not contributing much to the rising sea levels. The phenomenon started in early 2000s when Greenland witnessed regional warming. High temperature removed the barriers of ice debris in the northeastern part of the island. The barriers had so far prevented melted ice from falling into the ocean. The finding, which is likely to boost estimates of the expected global sea level rise, appears in the March 16 issue of the journal Nature Climate Change. Led by Shfaqat Abbas Khan of National Space Institute at the Technical University of Denmark, the study was conducted by a team of researchers from Denmark, the Netherlands, the US and China. They found that from 2003 to 2012 northeast Greenland dumped 10 billion tonnes of ice annually into the ocean. The region, which was kept out of calculations in prediction models, will play a crucial role now. Greenland as a whole is already one of the main contributors to rising sea levels. Over the past 20 years, it has accounted for an increase of 0.5 mm per year, out of a total increase of 3.2 mm per year. “The fact that the mass loss of the Greenland Ice Sheet has generally increased over the last decades is well known,” says Khan, “but the increasing contribution from the northeastern part of the ice sheet is new and very surprising”. 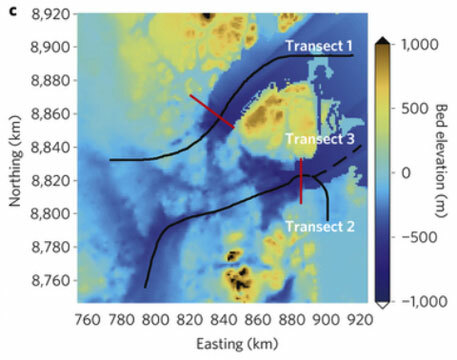 The study shows that northeastern Greenland lost ice due to a major retreat of an outlet glacier connected to a long “river” of ice. Known as ice stream, it drains ice from the interior of the ice sheet. The Zachariae ice stream (ZI) retreated about 20 km over the past decade. For comparison, one of the fastest moving glaciers, the Jakobshavn ice stream in southwest Greenland, has retreated 35 km over the past 150 years. Historically, ZI drained slowly because it had to fight its way through a bay choked with floating ice debris. Now that the ice is retreating, the ice barrier in the bay is reduced allowing the glacier to speed up and draw down the ice mass from the entire basin. Khan said increased ice flow in this region is particularly troubling because the northeastern ice stream stretches more than 600 km into the centre of the ice sheet, where it connects with the heart of Greenland’s ice reservoir. According to previous measurements and aerial photographs, the northeastern Greenland ice sheet margin appeared stable for 25 years, until 2003. Around that time, a string of especially warm summers triggered increased melting and calving events, which have continued to the present day. “This implies that changes at the margin can affect the mass balance deep in the centre of the ice sheet. Furthermore, due to the huge size of the northeast Greenland ice stream (16 per cent of the total), it has the potential of significantly changing the total mass balance of the ice sheet in the near future,” Khan adds.